The GTSC Faustus is a Terran-designed science ship. It is one of the oldest ships serving the Allied fleet, originally commissioned by the GTA after the start of the Terran-Vasudan War. The Faustus served the GTA until 2345, and the GTVA from 2345 till the end of the Second Shivan Incursion in 2367. The Faustus is an extremely fragile ship, with six low-damage turrets and barely enough hull plating to ward off even a single wave of fighters. This, combined with its tremendous logistical value, means that the Faustus is never seen near a battlefield except under the most desperate of circumstances or the best of reasons. During the NTF Rebellion, at least one Faustus was known to have defected to the Neo-Terran Front. The Faustus Science vessel was, and still is, a civilian craft. However, in the 14 years since the Terran-Vasudan war began, more and more of these were commissioned by the GTA in order to pursue military research. However, its obvious value, poor fighting capabilities, and lack of speed make it a prime target for enemy ships; hence, you will rarely find many of these anywhere near the front lines of battle. The GTSC Faustus is primarily a class of civilian research vessels. During times of peace, they serve as mobile laboratories for scientists in many disciplines. 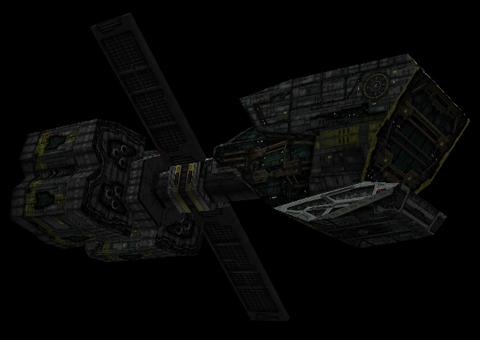 During wartime, however, Faustus vessels are commandeered by the military, mostly for weapons research. It was on a Faustus ship, during the Great War, that Shivan shield technology was first reverse-engineered from a captured Shivan fighter. 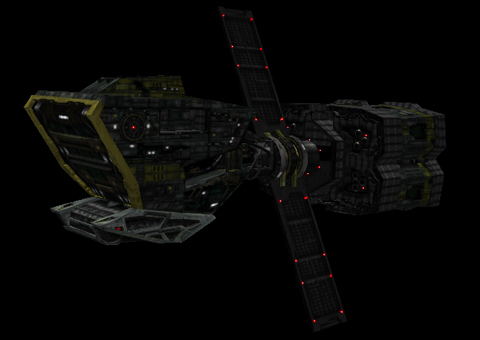 Faustus vessels have poor armor and only a few weak turrets for defense. Only desperate circumstances find a Faustus anywhere near the front lines. In Latin, faustus means "auspicious" or "lucky." In classical German legend, Faust is a character who makes pact with the Devil. Faust's character is assumed to have been based on Dr. Johann Georg (1480 – 1540) , a German magician and alchemist. This ship is less well armored than the GTT Elysium while having a much bigger target profile, and also has horrible turret placement. There's really nothing tactically viable about this ship, so don't ever treat it like it is. When escorting, this should be at the top of your priority list, because a couple of Cyclops torpedoes will take this brick down. Using bombs on a Faustus is wasted effort. It might just shoot them down, blobs are good at that, and killing it with primaries is simple enough. But in special cases, NEVER get near a Faustus; its windmill blades will mash you up! It should be noted that the Faustus' armament is asymmetrical. One of the turrets has the ability to fire missiles (Rockeyes and Tempests in FS2) and lasers (Terran Turret Weak and Akheton SDG) simultaneously, something which few turrets even on larger ships are capable of.